Visitors to Hamburg Convention Bureau’s stand at IMEX in Frankfurt can step inside one of Europe’s largest convention centres and virtually explore the redeveloped venue’s 50 halls in advance of its official opening. Specially developed VR headsets using new ‘unreal engine’ technology enable planners at the show to move through the Congress Center Hamburg (CCH) and interact with the space. The resulting visual experience is comparable to a real walk through the new CCH and by far exceeds static 360 degree views. The new CCH will be the largest of its kind in Germany when it reopens in 2020 with a 12,000 sqm exhibition area and 12,000 seats in up to 50 halls. The redeveloped centre will be able to accommodate several concurrent events and the entrance hall, rising as tall as the main building, provides an additional multi-purpose space. Joining the CCH team at Hamburg Convention Bureau’s stand at IMEX are a vast range of hotels and venues. This includes three 5* hotels – the largest privately owned 5* conference hotel in Germany, the Grand Elysee; the Hotel Atlantic Kempinski and the recently-opened The Fontenay, which offers breath-taking views over the Alster Lake from its 131 rooms and suites. Other hotels on the stand include the greenest hotel in Germany – the Scandic; hip design hotel Gastwerk and Jufa Hotel Hamburg HafenCity – a new four-star, 200 room hotel located in the heart of Europe’s largest inner-city development project. It has five workshop and seminar rooms, hosting up to 500 participants. TUI Cruises, one of the leading catering and event suppliers Nord Event and UNESCO World Heritage Site Lübeck, ensure there is a wide range of venues, destinations and suppliers from across the Germany’s celebrated maritime region for planners to meet. Hamburg Convention Bureau is at stand number G100 at IMEX in Frankfurt, taking place 15 – 17 May 2018.
Business Events Denmark’s strong focus on top funnel marketing means more MICE business for Denmark. At ITB 2018 in Berlin VisitDenmark’s MICE team was handed one of the prestigious “Golden City Gate” awards for the results. “As a popular MICE destination the key to attracting more business is to increase the awareness and knowledge of your USPs and products. We do that today with a strong focus on digital platforms. In fact, after rolling our new digital strategy out in 2017 we have managed to create a 13 percent increase in consideration for Denmark and Copenhagen among buyers and planners on the German market. Something we achieve without sales representatives on market offices,” explains Erik Mortensen, Head of Business Events Denmark. “Digital platforms offer us the best and most cost efficient way to bridge the gap between important customer touch-points like IBTM and IMEX and the awareness building needs of a destination like Denmark,” says Erik Mortensen. One way Business Events Denmark measure the success of the awareness building and digital efforts is how many guests and scheduled meetings the team is able to attract to the Denmark stand at tradeshows like IMEX and IBTM. Stop by the IMEX Denmark stand at F265 and see for yourself how busy the Danes are during the three days in Frankfurt. 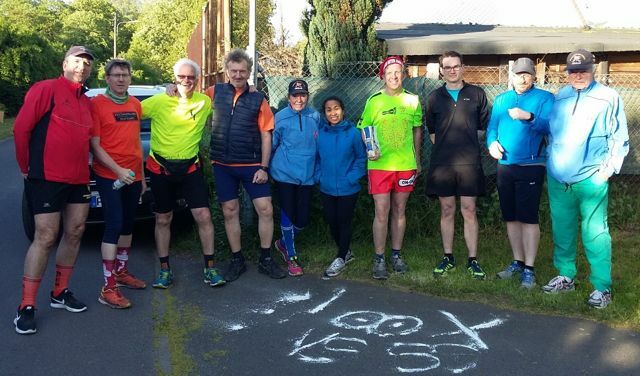 We run in and around Frankfurt, in the forest, on gravel and on asphalt. Participants are members of all age and social groups, without regard to nationality, or religion. The international language is English. At present our members, are Americans, Brits, Finns, Japanese, Russian and German. Visitors are always, welcome. After the run, the group meets up. There are drinks (most importantly beer), and everyone discusses the run, weather and life in general. The sporting part of the Hash is then balanced with, socializing. There are no firm rules, no annual, membership fees. We only charge 3 Euro for, every run, which is for flour, snacks and drinks. Frankfurt Hash Monday R*N #1689 – Frankfurt Rödelheim – Meet us every monday in summer in Frankfurt and Rhine-Main Area. Every two years, an international meet is organised, referred to as the InterHash. Members at one will vote for the next location and so on. Attendance recently has been about mare than 5000. Following its launch in December 2016, The Sanya EDITION is looking forward to welcoming guests to its exclusive Hainan Island location without the added complication of a visa application. Effective from 1st May 2018, citizens of 59 countries may enjoy 30-day visa-free access to Hainan Island. Travellers from 59 countries including the United Kingdom, all EU countries, Balkan countries, United States, Canada and many more countries in Asia, Australia and South America are eligible for the new policy. Groups and individual visitors from these countries can visit the Hainan Province in China for 30 days visa-free as long as their trip tours are booked through registered travel agencies and are approved by the China National Tourism Administration. Centrally located in Haitang Bay, The Sanya EDITION is set within 50 acres of meticulously landscaped lush tropical greenery featuring a striking 20,000 m2 private ocean overlooking the South China Sea. The Sanya EDITION comprises 512 residential-style guestrooms, including 46 suites, and an additional 17 exclusive hotel villas nestled into a terraced hillside, each one with a private pool and private outdoor space. Delivering on the new-luxury promise, all guestrooms in the horseshoe-shaped hotel offer stunning ocean views. With a selection of food and beverage outlets, guests are able to experience a wide range of cuisines, all using locally sourced fresh ingredients. The meticulously designed environment also enables extraordinary and special dining experiences, such as on the illuminated floating platform secluded on the private ocean. Spa and activities on the private ocean can also be arranged for the ultimate resort experience. Located on the southern end of Hainan Island, Sanya is regarded as China’s tropical holiday destination with bays of beach resorts. For those looking for a romantic location to tie the knot, hotel’s year-round tropical weather and expansive banqueting hall make for a perfect and unique wedding location. With the revolutionary, multigenerational Playland, The Sanya EDITION is also ideal for those travelling with a family.